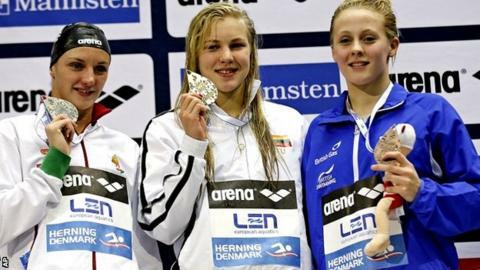 Siobhan-Marie O'Connor won her second medal of the European Short-Course Championships with bronze in the 100m individual medley in Denmark. The 18-year-old from Bath clocked 58.26 seconds to finish behind Plymouth-based Ruta Meilutyte of Lithuania and Hungary's Katinka Hosszu. O'Connor had already won the silver medal in the 200m individual medley. Wales' Jazz Carlin was sixth in the 400m freestyle in a personal best 4:00.92, with Hannah Miley seventh.